Poverty strikes one third of French families in which one parent is absent, writes Anne Chemin on the front page of Le Monde, thus giving ammunition to those who point out that the break-up of the family (in whatever country) is conducive to penury. …avec la séparation, les familles subissent une brutale chute de leur niveau de vie. Cette fragilité se lit clairement dans les chiffres de l'Insee : en 2008, 30 % des personnes issues d'une famille monoparentale vivaient en dessous du seuil de pauvreté (un niveau de vie inférieur à 949 euros par mois), soit une proportion 2,3 plus forte que dans l'ensemble de la population. Le taux de pauvreté est beaucoup moins élevé pour les autres configurations familiales : il tombe à 20 % pour les couples avec trois enfants ou plus, 8,6 % pour les couples avec deux enfants et 7,8 % pour les couples avec un enfant. In related news, a father has been arrested for smothering his 6-year-old daughter to death, because taking care of the handicapped child had become "too heavy a burden", and he is risking life behind bars. Remember, this is NOT jingoism. Only American can be guilty of that. Sihem Souid, 29 ans, a brisé la loi du silence en publiant un livre sur les abus de pouvoir, l'homophobie, le racisme et le sexisme au sein de la police. Suspendue, elle attend le conseil de discipline qui doit statuer sur son sort. For Le Monde, Josyane Savigneau interviews Sihem Souid, the 29-year-old policewoman who was suspended from the French police force for "breaking the omerta" by publishing a book detailing the abuse of power, the homophobia, the racism, and the sexism in the French police. 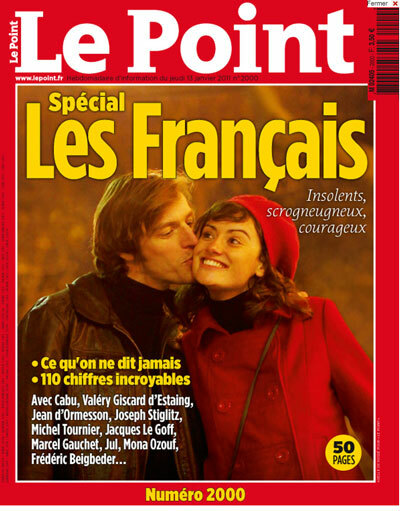 A month ago, Sihem Souid was defended in print ("une femme hors du commun, une héroïne des temps modernes") by Arnaud Montebourg. Dans votre livre, vous signalez que l'on dit souvent aux policiers qu'ils ne sont pas des travailleurs sociaux, qu'ils sont donc là avant tout pour réprimer. Je crois que la répression à tous crins ne parvient à aucun vrai résultat. Les gens se braquent. Il faut autant de prévention que de répression. Un fossé s'est créé entre les citoyens et la police. Il faut redonner confiance en la police. Or, aujourd'hui, la prévention est sacrifiée. Au profit d'une politique sécuritaire où on convoque les caméras pour montrer aux citoyens qu'on agit, mais c'est un leurre. …je ne dis pas uniquement du mal de la police, mais on occulte ce que je dis de positif. …Un éditeur du Cherche Midi a rencontré Mme Bougrab à une réception. Elle l'a interpellé à mon propos en menaçant publiquement de représailles ma maison d'édition et moi. Just Who is it Who's Parrotting Hate ? Foreign Policy: Obama is learning the price a president pays when lofty rhetoric meets hard reality. editorializes Washington Times as it turns out that the Obama administration is ramping up its secret war on terror and as the paper notes that the "total deaths in Afghanistan in 2010 are greater than the sum of the deaths suffered in the first seven years of the war, a period the president reflexively derides as a failure.". The unbridled and naive optimism that ill-served the country in Mr. Obama's failed freshman outing gave way to a sense of policy drift in 2010. Even the president began to question whether the United States should maintain its primary global leadership role. …Now the White House is on the verge of declaring defeat and issuing an executive order affirming the unlimited detention of terror suspects. Mr. Obama is learning the price a president pays when lofty rhetoric meets hard reality. Mr. Obama's unprecedented outreach to the global Muslim community has gone bust. Despite continued obsequious gestures in their direction, [the] effort has had no impact in reducing the threat of international terrorism and has engendered a sense of American weakness in the region. …The Middle East peace process is no farther along than it had been a year ago. … Mr. Obama's 2009 Nobel Peace Prize, which was characterized as "a down payment" for future achievement, remains frozen in escrow. The war in Afghanistan continued with mixed results. … The total deaths in Afghanistan in 2010 are greater than the sum of the deaths suffered in the first seven years of the war, a period the president reflexively derides as a failure. …The year saw no solid progress in dealing with the threats posed by the North Korean and Iranian nuclear weapons programs. …The politically wounded president enjoyed two last-minute victories when the lame-duck Congress flew to his rescue by ratifying the New START nuclear-arms treaty and repealing the ban on homosexuals serving openly in the military. These were only victories for Mr. Obama on the domestic political scene. The START agreement will weaken the U.S. nuclear deterrent and hamper future missile-defense deployments. Having openly homosexual troops will be devastating to morale in the armed forces, and in practice the new policy's implementation will lead to the establishment of a privileged homosexual protected class with ramifications that will reach beyond military service. Indeed, George Neumayr opines that Political correctness in Obama's military will assume a paradoxical character, becoming at once permissive and puritanical. …Other notable events include the administration's failure to rally the international community to impose global energy restrictions to counter purported global warming - a White House letdown that was a victory for everyone but climate alarmists - and continuing to expand the use of drone strikes against terrorists, a sensible policy that is generating low level murmurs of "war crimes" among Mr. Obama's disappointed former supporters in the peace movement. During his trip to India in November, Mr. Obama acknowledged and accepted America's decline. "For most of my lifetime," he said, "the U.S. was such an enormously dominant economic power ... that we always met the rest of the world economically on our terms." Now those days are over, which the president considers a good thing. Our nation also faces increased political competition from assertive rogue states, a resurgent Russia, looming China acquiring more U.S. debt and a variety of challenges the Obama national-security team has shown no ability to confront effectively. Mr. Obama would have us believe that American decline on his watch is inevitable, but he is as much its cause as its casualty. Obviously, Honors has dishonored himself. But it is not at all clear why advocates of open sexuality in the military should be so appalled by his behavior. Do they really find "raunchy" behavior shocking? If so, why do they endorse gay pride parades that exhibit the same juvenile and licentious behavior? …Spokesmen for military groups representing gay soldiers also expressed dismay at the conduct of Honors. These groups appeared very eager to prove their disciplinary bona fides and apparently saw in this episode, which involved "anti-gay slurs," a propagandistic chance to appear pro-gay and pro-discipline at the same time. None of this moral outrage, however, is very convincing, for the philosophy underlying political correctness in the military is on the side of permissiveness and aberrant sexual expression. The whole point of the gay rights movement is to say that "no one chooses" their sexuality and thus it is an inherently undisciplined area of life. Since the now-officially approved moral philosophy of Obama's military says that disciplining one's sexual desires means "living a lie," we should expect many more "expressive" episodes in the military's future. …It appears that political correctness in Obama's military, like political correctness on Ivy League campuses, will assume a paradoxical character and be at once permissive and puritanical, endorsing liberation from traditional morality while arbitrarily regulating the terms of that release. In Obama's Animal Farm, some sins are more equal than others, and homosexuality is chief among them. No sooner had the policy of "Don't Ask, Don't Tell" fallen than Joe Biden was blurting out happily that "gay marriage" is "inevitable," which removes any doubt about Obama's actual position on the subject. Biden's comment exposes Obama's stated opposition to gay marriage as nominal and meaningless -- a temporary opposition on cravenly political, not philosophical, grounds. He favors gay marriage, but the coast isn't quite clear enough yet for him to endorse it formally. Having openly homosexual troops will be devastating to morale in the armed forces, and in practice the new policy's implementation will lead to the establishment of a privileged homosexual protected class with ramifications that will reach beyond military service. Obama : l'année de la déception ? Aux Etats-Unis, l'année 2010 est marquée par les élections de mi-mandat et la défaite du camp démocrate de Barack Obama. Mais si, au lendemain du scrutin, la fin de l'année s'annonçait catastrophique pour le président américain, les dernières semaines ont finalement tourné en sa faveur. Quel est le bilan de Barack Obama durant l'année 2010? Émission préparée par Bilal Tarabey et Yi Song. Nicolas Sarkozy on Islam: the French "Republic will never allow any religion to impose its rules"
As the troubles in Tunisia lead to an embarrassed silence prevailing throughout Europe, says Le Monde's Isabelle Mandraud — how different the reactions (or absence thereof) when troubles, alleged or otherwise, break out in America, n'est-ce pas? — and as Yves Bordenave covers the Paris trial of eight Jihadist Muslims for engaging in hold-ups, Le Monde's Stéphanie Le Bars reports that Nicolas Sarkozy has given a speech referring to the perceived threat of Islam in France and stating that the French "Republic will never allow any religion to impose its rules." Sans évoquer explicitement le supposé choc des cultures entre l'Orient et l'Occident, M. Sarkozy a estimé que "le sort des chrétiens d'Orient symbolise les enjeux du monde globalisé dans lequel nous sommes entrés, irréversiblement". "Nous ne pouvons pas accepter que cette diversité humaine, culturelle et religieuse qui est la norme en France, en Europe, disparaisse de cette partie du monde. Les droits qui sont garantis chez nous à toutes les religions doivent être réciproquement garantis dans les autres pays". "La liberté de culte et la liberté de conscience sont consubstantielles à la démocratie", a-t-il rappelé. …Sans jamais employer le terme de "laïcité positive", théorisée au début de son quinquennat, le chef de l'Etat a aussi, devant les responsables religieux, redit sa conception de ce principe républicain et du rôle des religions dans le débat public, estimant notamment que les croyants ne devaient pas être enfermés "dans leurs églises, leurs synagogues, leurs temples ou leurs mosquées". "Une République laïque entretient un dialogue permanent avec les religions, de façon à les entendre et parfois, pourquoi pas à les écouter." Même si, précise-t-il, "la République ne laissera jamais aucune religion lui imposer sa loi". Assumant sans la citer la loi interdisant le port du voile intégral, M. Sarkozy estime que la République doit en revanche intervenir "lorsque des pratiques, présentées souvent à tort comme religieuses portent atteinte à d'autres principes démocratiques". Il évoque enfin sans s'appesantir le paradoxe qui entoure la question de la construction des lieux de culte musulman et les récentes polémiques soulevées par Marine Le Pen sur "les prières de rue". "La République ne peut pas accepter qu'une religion investisse l'espace public sans son autorisation mais cela implique que la République tienne ses promesses en permettant que chacun puisse prier dans des lieux dignes", a-t-il indiqué, sans rappeler que la loi de 1905 interdit de subventionner les cultes. — We want to seek refuge in Europe!! BBC on a Muslim's Killing and Wounding of Half a Dozen Christians in Egypt: "it is unclear whether the attack was sectarian"
An off-duty policeman has opened fire on a train in Egypt, killing a Christian man, but it is unclear whether the attack was sectarian. It is unclear whether the attack was sectarian! We learn that "Officials said at least four of those hurt [there were five wounded altogether] were Coptic Christians" and we learn that "Witnesses said hundreds of Christians later clashed with police outside the hospital where the wounded were taken" and we are reminded that "Tensions between Muslims and Christians in Egypt have been high following a bomb attack on a Coptic church in Alexandria at the new year that killed 23 people." But! It is unclear whether the attack was sectarian! The BBC's Jon Leyne reports from Cairo that it is difficult to see how the gunmen would have known he could target Christians by boarding the train. Update: "We don’t want to jump to conclusions" adds Instapundit (shookhran for the link, Professor Reynolds). "That might promote hatred." Update 2: That was quick! Only a day or two ago, Joe Kovacs was reporting on Rush Limbaugh's posing a new question. "Just ask yourself this. If the shooter had been a 22-year-old named Muhammad, would we be hearing that Muslim talk radio and the Muslim Internet blamed for it?" the top-rated host asked today. "No, we'd have been told that we can't blame Muslims for the action of one kook." We didn't expect a bona fide illustration of the (all-too-obvious) answer to come all the way from the Red Sea, but now we have one, don't we? including two letters that view the words "GOP" and "Birthers" through a sniper scope. The WND article follows with an example of an email containing "incendiary rhetoric and threats", however it is not language that the Left does not find offensive, or certainly not offensive enough to warrant condemnation, precisely because… it comes from the Left. This is to inform you that LTC Larkin (sic) is a F------ COWARD who should be put in front of a firing squad and shot. If I see his a-- on the streets of Washington I will save the government the expense of a trial, I'll dip a bullet in s--- and shoot him in the head. This f--- off deserves to die on the streets of America. Sparks fly in the France 24 Debate as Republicans and Democrats spar over the ups and downs in 2010 of a certain Barack Obama. He signed landmark healthcare legislation into law, but his Democrats got thumped in the midterm elections. Now can he rebound? You won’t find consensus on François Picard’s panel. Due to the Tucson Schooting, According to the French, the "Tea Partiers Are in the in the Dock"
(Updated below) Go to Instapundit to see (a massive amount of) evidence to the contrary, especially Glenn Reynolds' own article in the Wall Street Journal, The Arizona Tragedy and the Politics of Blood Libel. As for martial metaphors, Le Monde itself has a doozy, featuring a (sports) article called Que signifie selon vous l'hécatombe des clubs de Ligue 1 en 32es de finale de la Coupe de France ?, i.e., referring to the (sorry) fate of the predominant league in French soccer clubs in the 32nd-finals (!) towards the Coupe de France, whose mass elimination is described as a "massacre" or a "slaughter". Chacun interprétait à sa façon les "écrits" laissés sur la Toile par Jared Loughner. Ils manifestent effectivement une grande incohérence - des spécialistes ont parlé de "schizophrénie" -, mais aussi des détestations qui, sur certains points, rejoignent des thèmes usuels de la mouvance du Tea Party : la détestation du "gouvernement", c'est-à-dire de l'emprise de l'Etat fédéral, ou le retour à l'étalon-or, une idée promue par ceux qui prônent l'abolition de la Réserve fédérale (banque centrale américaine). The critics were a bit short on particulars as to what that meant. Mrs. Palin has used some martial metaphors—"lock and load"—and talked about "targeting" opponents. But as media writer Howard Kurtz noted in The Daily Beast, such metaphors are common in politics. Palin critic Markos Moulitsas, on his Daily Kos blog, had even included Rep. Gabrielle Giffords's district on a list of congressional districts "bullseyed" for primary challenges. When Democrats use language like this—or even harsher language like Mr. Obama's famous remark, in Philadelphia during the 2008 campaign, "If they bring a knife to the fight, we bring a gun"—it's just evidence of high spirits, apparently. But if Republicans do it, it somehow creates a climate of hate. There's a climate of hate out there, all right, but it doesn't derive from the innocuous use of political clichés. And former Gov. Palin and the tea party movement are more the targets than the source. We barely knew all the facts in the immediate aftermath of the shooting, though, before this vicious act was being milked for political advantage by ghoulish opportunists on the Left. …The irony of criticizing the overheated rhetoric of your opponents at the same time you call them accomplices to murder apparently was lost on these people, most of whom have never been noted for their subtlety (or civility). It is vile to attempt to tar the opposition with the crimes of a lunatic so as to render illegitimate the views of about half of America. …why is it acceptable to condemn vitriol in politics while contributing to it in the same breath? This is what passes for restoring civility to our nation's discourse? What is really outrageous is how quickly so many jumped at the opportunity to politicize this tragic shooting — blaming the Tea Party and conservative political rhetoric without a shred of evidence to back those claims. …On Sunday, the New York Times published a front-page story, "Bloodshed Puts New Focus on Vitriol in Politics." Nowhere did it mention the vitriol hurled at Tea Party activists, who are routinely derided to as "tea baggers" and racists, and now stand accused of incitement to murder. If you want an example of the lack of civility plaguing our political discourse, look no further than this weekend's shameful efforts to use this tragedy to demonize the Tea Party. "France Is the Evil Empire as Far as Technology Theft Is Concerned"
France is in the midst of an industrial espionage scandal involving Renault and the "automaker has suspended several executives who are suspected of compromising its electric car technology" (the most likely culprit would appear to be China). "L'espionnage français est tellement étendu que les dégâts [qu'il provoque] pour l'économie allemande, dans leur totalité, sont plus importants que les dégâts provoqués par la Chine ou la Russie", selon une note non datée de l'ambassade des Etats-Unis à Berlin. Aftenposten, qui a obtenu par un moyen non connu en décembre la totalité des 250 000 documents diplomatiques de WikiLeaks, reproduit aussi, en norvégien, les propos en ce sens du patron d'un groupe allemand cité par une note de l'ambassade. "La France est l'empire du mal en ce qui concerne le vol de technologies, et l'Allemagne le sait", aurait déclaré en octobre 2009 Berry Smutny, directeur général du petit fabricant allemand de satellites OHB Technology.